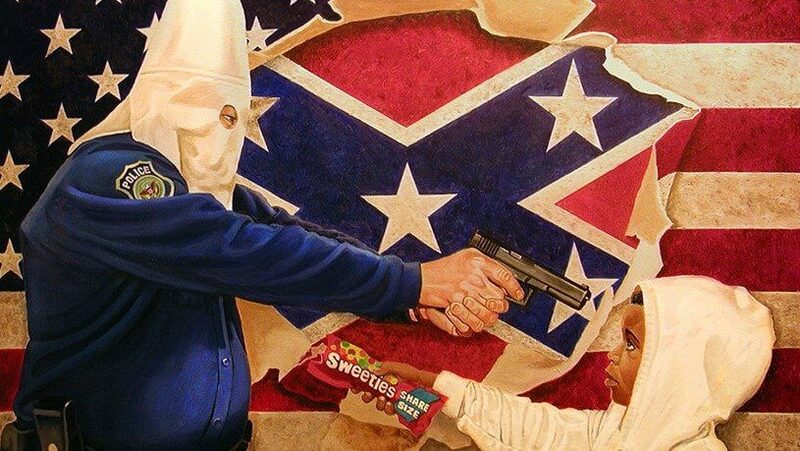 A Facebook friend of mine just set the above image as his profile cover photo. He’s an activist in the Black Lives Matter movement whom I became acquainted with while working on an election issue in my state. I look at this picture, and the first thing I think is: Wow. That’s… that’s really offensive. Then I look at it some more. I think about it. Then I realize that for some people, like my Facebook friend, this accurately represents how they perceive the world in which they live. We can criticize that. We can tell them that they are wrong to view the world that way. We can insist that things aren’t as bad as an image like this makes them out to be. And we may be right. But maybe we should stop and consider how terrifying life has to get for this to become your perception. What do we do with that? How can we have anything approaching a productive conversation about race relations and criminal justice issues when starting from such divergent perceptions of the status quo? Or maybe NOT since the underlying premise is an utter falsehood. Their perception is NOT based in “how terrifying life” has gotten to bring them to that viewpoint. Unceasing, decades long leftist indoctrination in the schools and media is what has led them to that viewpoint. Denial, that culturally and as a group, blacks reject the virtues of education, a strong work ethic, taking personal responsibility and being accountable for our actions, honoring familial obligations and that they reject delayed gratification are the reasons that blacks rest at the bottom of the socioeconomic scale. White cops are NOT making life ‘terrifying’ for blacks. Their own culture of violence and lawlessness is what is making life terrifying for law abiding blacks and rather than face the truth, they cowardly blame whites. The buying into the Leftist Narrative by Walter Hudson is a Moral Crime against Truth, a wretched Appeasement. And it it has the added value [for the Left only] of legitimizing the Nihilists calumnies against, specifically, Police Officers and, generally, against Freedom and Ordered Liberty. When are these people going to stop being Useful Idiots for an Ideology that seeks to destroy everything they supposedly stand for? As long as we continue to legitimize the false and Abnormal thinking of Left, we are guilty of providing aid and comfort to the Enemies of everything America stands for — and of being their Useful Idiots. Libertarianism is a fake religion for 14-year-old boys (who insist that “No one can tell me what to do!”), but we should grow out of that narcissistic thinking. I don’t even consider them on my side in the slightest. There are numerous rinos in the Indiana Republican party that operate this very way…that’s why the religious freedom law turned out as it did recently. Every bit as sensible as drafting Muslims into the Israeli political system just to FEEL inclusive . Some Friday: Wow, echoing sentiments at http://no-pasaran.blogspot.com/2015/05/wondering-why-slavery-persisted-for.html.